For Buddhists, water is an essential feature of any garden, with miniaturised waterfalls and lakes representing the deep symbolism that imbues the natural world. 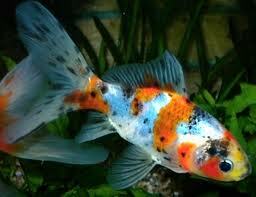 My understanding of my obsession with water is either because I’m an Aquarian or I was a fish in another life. The latter is now somewhat debatable. There are many, many reasons to incorporate a water source into your garden, with one of the most important being to attract bees. If bees have somewhere to easily grab a drink, they’ll happily visit your garden and pollinate your plants. How to provide a safe, accessible water source for bees is, however, the subject of another post. Today, as the south-westerly howls and there’s no chance of getting out into the garden, I thought I’d recount the simultaneously sad and happy tale of attaining equilibrium in my bath tub pond. Harsh lessons were learnt, including the one that goes: never, ever assume you know more about a fish than it does about itself. So, last year, as spring began to make itself felt, I started a project that had been on my wish list for a very long time. 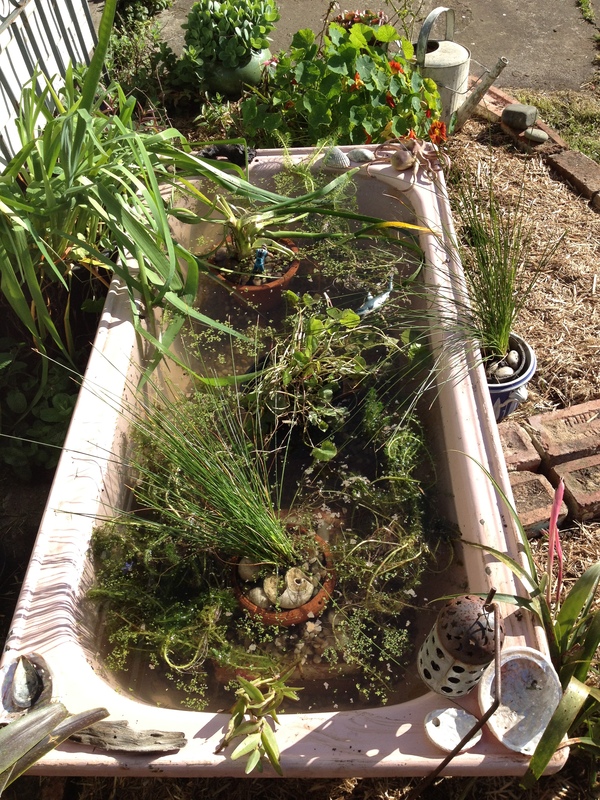 I’d finally found an old bath at a friend’s house, collected it, and there it sat, just waiting to be filled with water, plants and fishy life. I’d determined the perfect position; shade from about 1pm during the summer and enough winter sun to keep the water reasonably temperate. And I decided to build a garden bed around it, taking in the mandarin tree (with the dual purpose of ensuring we got lots of mandarins as a result of the bees). 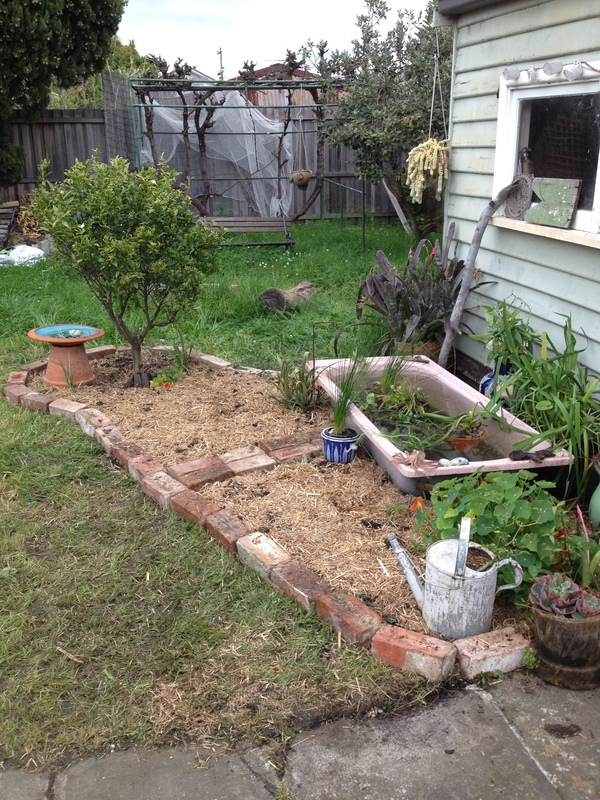 I used a rudimentary permaculture method to build the garden bed, as I couldn’t be bothered digging up all the grass. I laid down some old hessian, marked out the border with bricks, and then covered this with compost and manure. I factored in the plants I’d already established in the area around the pond, such as the nasturtiums and mint. The pond itself was already full by this time and I’d relocated water plants from my other water pots and lined the bottom of the tub with pebbles. I put a couple of bricks over the plug and a few bricks under the bath to raise it off the ground a bit. I bought eight mixed small Shubunkins and Golden Comets (what we generally think of as goldfish) from the local pet shop. All was just fine – they took to their new home like … well, I’m not going to say it – it’s too obvious. 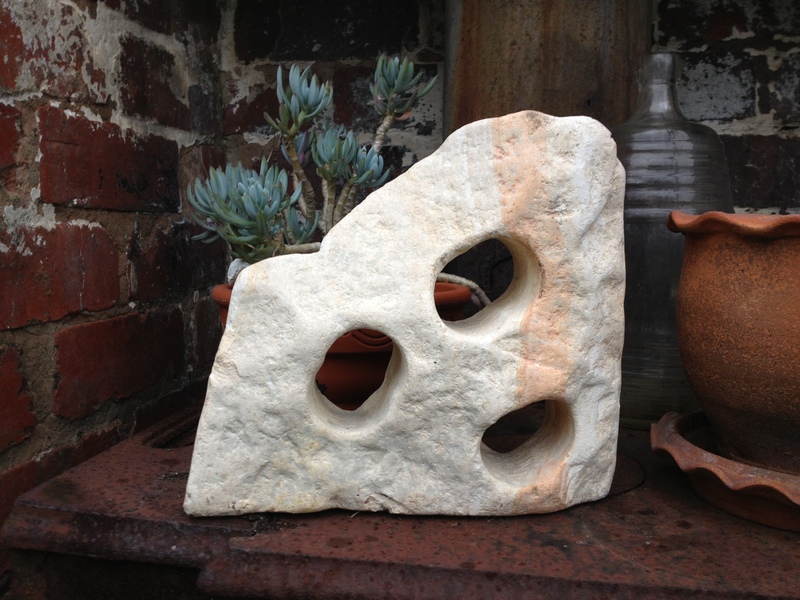 Then I decided they needed a rock to frolic around, so I bought a white stone from the same pet shop, assuming the fish would entertain themselves by swimming through the holes. How wrong could I be. This rock is now known as the rock of death. One after another, in the ensuing weeks, the fish died. Each day another would turn up its tail and I’d scoop it into the compost, deeply troubled and confused. All had seemed so blissful. What was wrong with my once tranquil pond? And of course each of the fish had been named by this stage, which made the fish apocalypse all that more traumatising. Finally, after the last fish had become fertiliser, I took a jar of the water to an aquarium and had it tested. Having established that the pH was really high, the guy asked me if I had any white rocks in the pond … That night I had a terrible dream, of trying to save my dying fish; a dream full of fish out of water and white rocks and the usual nightmarish element of guilt, guilt and more guilt. I returned to the same aquarium, had the water tested again (the pH was perfect this time) and the kids chose their Shubunkins. We brought them home, popped them in the tub, and they swam around, seemingly content. What the guy at the aquarium neglected to tell me was that large Shubunkins are kamikaze fish (kind of appropriate, really); they are known to throw themselves out of ponds. The first time I found a fish out of water, I’d got to it in time and scooped it back in. I just thought this was a strange fluke. Two days later and I found both fish outside the pond, and this time I was too late. Of course, they had names too. A quick internet search (after the tears had dried) established that large Shubunkins are reputed for throwing themselves out of ponds and it is advisable to cover the pond with mesh. All too little to late for our beautiful fish, and following on from the rock of death experience, I began to feel that I was cursed. Fish hated me; I was a fish killer. While sympathy was being expressed, I could see the snickers, the barely suppressed smiles of derision. I almost gave up. But now we have Fish A, Fish B and Fish C, three small Shubunkin, and equilibrium has been restored. Pond life is tranquil, bountiful and self-sustaining. A, B and C look after themselves – they seem happy and show no signs of being suicidal. 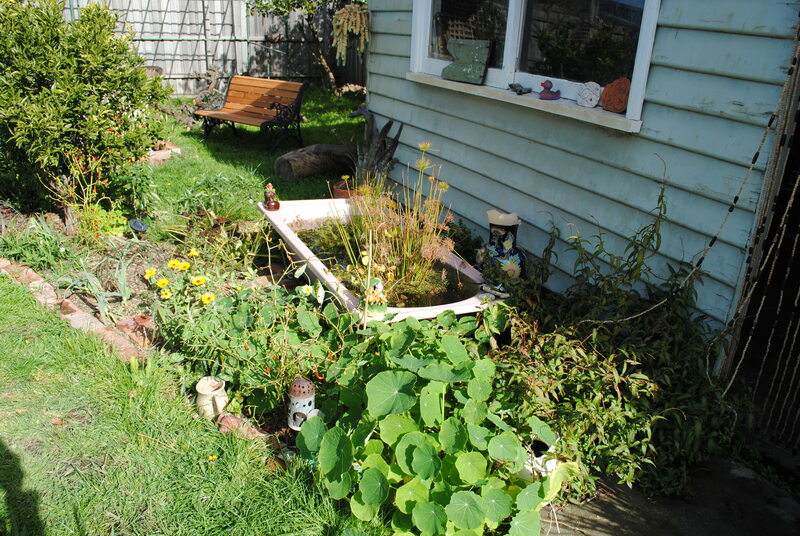 And the garden around my bath tub pond looks like it’s always been there, less than a year down the track. I’m planning on adding a few more fish, as soon as the weather warms up a bit. And we did have a bumper mandarin crop – over 200 of those little spheres of deliciousness. For more on the progress of the pond, and the garden in general, have a look at The War on Grass. I have learned one thing by the experience to keep fish alive in my pond Pondpro2000 to let them live with the fact that it’s eco-accommodating and make pond leak free. Do you have a pump in your pond? I grabbed a cheapie solar powered one of the internet to circulate and aerate the water a little bit, as well as provide some “flowing water” sounds for the garden. 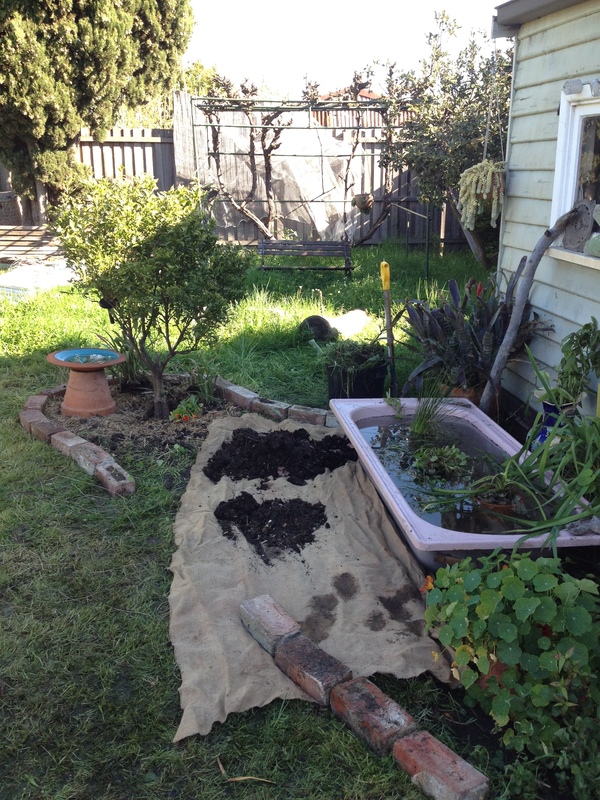 My pond is a recycled shower base, sort of like a bath, only square and only about 40cm deep. Perfect for growing Vietnamese Mint, Water Chestnuts, Taro and Kang Kong. Yes, I’ve got a pump, and it ran most of the summer. I looked for a solar one, but they’re not readily available except online, and I wanted instant results at the time! I find it hard to believe that solar ones are not the standard. At the moment, as there’s so much rain, I’m not bothering with the pump. But the fish do love it when it’s on. And if you check out the feature image of this post, my Vietnamese mint has gone nuts next to the pond, which happens to be in one of the wettest parts of the garden. I’ve successfully grown water chestnuts but what is Kang Kong?